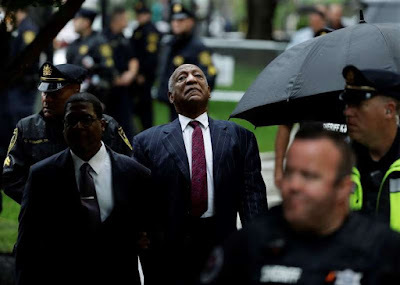 NORRISTOWN, Pa. — A judge declared Bill Cosby a "sexually violent predator" on Tuesday as a first step toward sentencing the 81-year-old comedian for drugging and sexually assaulting a woman over a decade ago. Montgomery County Judge Steven O'Neill made the decision as he prepared to sentence Cosby for violating Temple University women's basketball administrator Andrea Constand at his suburban Philadelphia estate in 2004. Constand, 45, said her training as a professional basketball player had led her to think she could handle anything, but "life as I knew it" ended on the night that Cosby knocked her out with pills and violated her.